Props to Bruce for a great tour of Maui Brewing Company today. Aloha was in the air! The company’s strong commitment to the local economy and concern for the environment was evident. Their beer is packaged solely in aluminum cans (made locally from recycled aluminum). They use local ingredients such as coconut & pineapple, and their spent grain is given to local farmers, helping contribute to local island sustainability. The brewery, located in an industrial area just across the highway from Old Lahaina Town, is nothing fancy. Brewing since 2005 at 100% capacity, it’s just what they need – nothing more, nothing less. 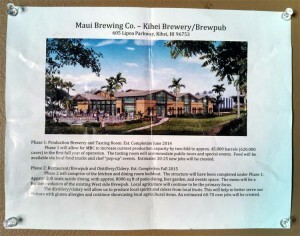 Although, they are expanding operations to a new Brewery and Brewpub in Kehei, about 45 minutes south east. They just broke ground three months ago. The new facility is expected to open in June of 2014 (Phase 2 in 2015).